This dish rocks my world. The smooth buttery yellow potatoes paired with the firmer, milder flavored red potato gives a really good depth to any meal. You'll almost feel like you're eating 2 side dishes in one (and I guess technically you are...). Or if you love potatoes like me, you could just eat this for your meal. 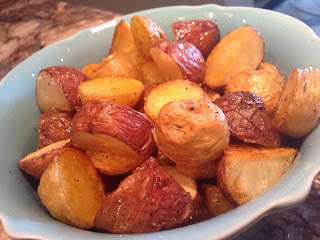 The bottom side of these potatoes are crispy and yummy like a fried potato and the skins on top also get slightly crisp. The inside, however, stays smooth and creamy - yum! Preheat oven to Roast at 400 degrees. 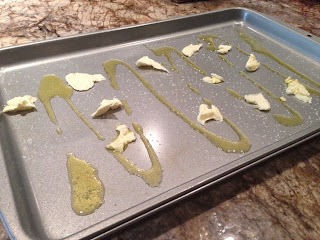 Drizzle olive oil on pan and divide butter and place in 4 or 5 spots on the pan. Place the pan in the oven just long enough to melt the butter. Sprinkle 1 tsp of the the kosher salt and granulated garlic in the oil. Cut the yellow potatoes in half and place them cut side down in the heated butter/oil. 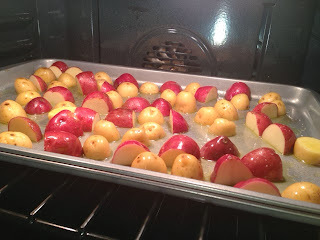 Cut the red potatoes into quarters and place them cut side down in the butter/oil. 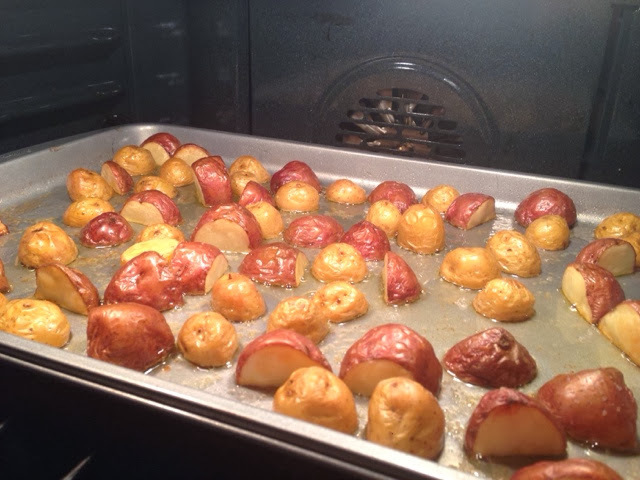 Spray the top of the potatoes with cooking spray or olive oil. Place in the oven for 50 minutes. Remove from the pan and sprinkle with the remaining 1 tsp of kosher salt and pepper to taste. Serve and enjoy!